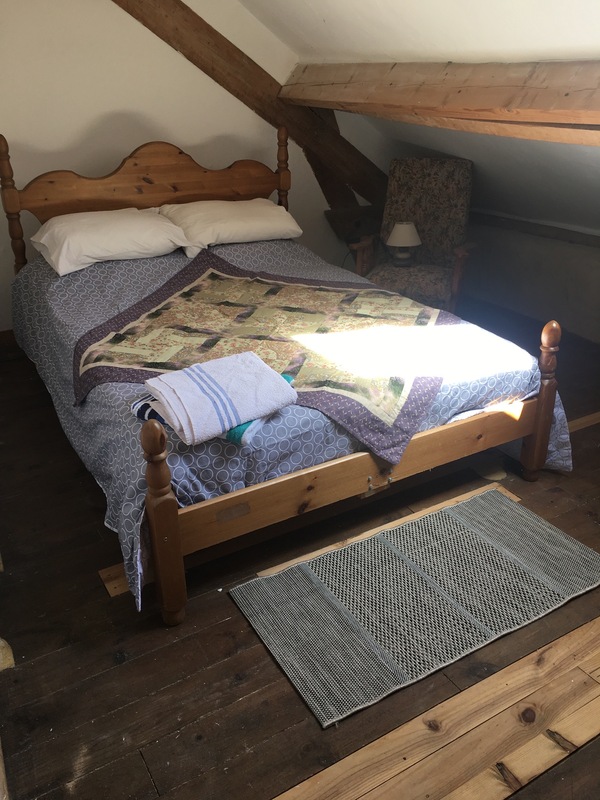 This three bedroom apartment is situated above Petite Maison, with skylights giving a large amount of light, illuminating the traditional wood floors and large oak beams. The three bedrooms, composed of 2 doubles and a single are perfect for families. The front door opens onto the decking allowing unrestricted views into the valley, and for the sunrise to be viewed in all its glory. The open plan kitchen is fully equipped with crockery, cutlery, oven, fridge, microwave, kettle etc. The table comfortably seats six, allowing the whole family to enjoy a meal together. The open plan living room has a double 'click-clack' sofa bed, armchairs and a rocking chair, so everyone can sit around and enjoy the natural light from the skylights. The three bedrooms offer ample space. Inside there are oak beams supporting the roof, with many skylights scattered throughout through which the stars can be seen, and admired from the warmth of bed. This gite benefits from a shower room. This has a new shower, sink and toilet in a clean and bright room. A woodburner provides a functional and romantic ambience for those chilly Spring evenings. Various outdoor activities are available as well as boardgames and a selection of books. Wi-fi is available throughout the property. As well as having privacy, there is also an area set up to encourage socialising under a shaded barn, this can be set up with a screen and projector or just tables and chairs for an evening sharing the experiences of the day. Suitable for people looking for a great base from which to explore. The comfortable 3 bedrooms are great for families. If wheelchair accessibility is required contact us for more information on this.